You may be familiar with the phrase “follow the water” when it comes to the search for life on Mars, and for good reason—any place on Earth where there is liquid water, there is life. So, logically, the best places to look for evidence of past or present life on Mars would be where there has been liquid water in the past (or perhaps even still is, underground). But now there is also another approach being taken, in terms of possible present-day habitability in particular: follow the salt. For a long time now, it has been postulated that liquid water might still be possible on Mars today—thanks to salts. From the various lander and rover missions, it is already known that salts such as perchlorates are common and widespread on Mars. Bright deposits have even been churned up from just below the surface by the rovers’ wheels (see image above). These deposits are evidence for liquid water on or near the Martian surface in the distant past. But what about the present? On Mars’ surface, it is too cold (most of the time) and the air is too thin to normally support liquid water. But water with a high salt content—i.e. brines—can remain liquid under lower atmospheric pressures and in lower temperatures than pure liquid water can. To scientists, the perchlorate salts are an exciting discovery. As Chris McKay from NASA Ames Research Center puts it, “I would say it is probably the most important astrobiological discovery since Viking—the discovery of perchlorate.” The perchlorates could explain why the Viking landers in the 1970s failed to find any organics in the soil, even though the other life-detection tests (for microbes) gave seemingly positive results. When the soil was heated, the perchlorates would have reacted to destroy any organics present. Salts could also help the soil to better retain water absorbed from the atmosphere—a process called deliquescence. This would be very beneficial for any putative microorganisms, as more moisture would be retained during more humid periods. But these salts may also have other implications for possible microbial life; if there are any pockets of liquid water still underground in places, they might provide an ideal niche for life to survive. Such briny water can be very inhospitable for most life forms, except perhaps for some extremophiles. But on a dry planet like Mars, any water might be better than no water at all. As it turns out, these brines may have already been observed directly from orbit. The Mars Reconnaissance Orbiter has found several locations where briny water seems to be coming to the surface from below. These dark streaks flow downward on sun-facing slopes; known as recurring slope lineae, these streaks are seasonal in appearance and always form on such warmer slopes. 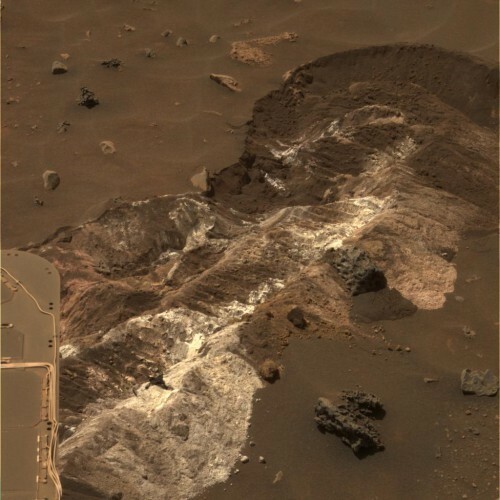 Briny water is still considered to be the best explanation, noting that these type of streaks are different from others thought to be caused by dry dust avalanches. It is also thought possible that some less toxic salts, other than perchlorates, may be involved. It is also possible that non-salty water may still exist on Mars, deeper below the surface where temperatures would be warmer. Subsurface aquifers would indeed be an exciting find. Either way, given all of the new evidence we now have, it would seem prudent to follow both the salt and water, in the quest to discover past or present Martian life.